순창읍 남계리에 있었던 석장승으로, 원래는 한 쌍으로 세워졌던 것으로 보인다. 남계리 석장승은 커다란 자연석을 앞부분만 조각하였다. 석장승은 전체적으로 살찌고 무거운 모습이며 옆으로 찢어진 가는 눈, 가늘고 손상된 코에 작은 입과 장난스럽게 혀를 조금 내민 모습을 하고 있다. 이마와 양 볼에 조각된 둥근 점은 연지 곤지를 찍은 모습을 연상케 하여 여장승으로도 보여진다. 제주도의 돌하루방처럼 표현된 양손은 손가락까지 뚜렷하다. 보통 장승이 얼굴 부분만 표현한 것과는 달리 손가락 등을 조각해서 사실적으로 나타낸 것이 특이하다. 남계리 석장승은 정확한 제작 연대는 알 수 없지만, 형식에 얽매이지 않고 토속적이고 민중적인 특색 잘 나타내고 있는 민속문화재이다. ※ 순창읍 남계리에 있던 석장승은 2004.12월 순창-남원간 도로변의 순창문화회관 뒤뜰에 순창 충신리 석장승(국가민속문화재 제101호)과 함께 옮겨졌다. 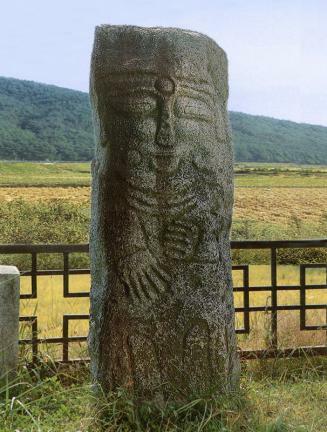 This stone guardian post is standing alone in Namgye-ri, Sunchang. It must have been a pair initially, but only one pole remains. The pole is standing on a stream bank along a wide road, 200 meters from Sunchang-eup, leading to Namwon. Like most guardian posts, it was erected wishing for peace in the village and for the health of villagers. According to the principle of geomancy, to supplement the weak vitality in the north direction of the village, the villagers had built a forest to block the north wind and placed guardian posts to protect the village. Unfortunately, the forest was cut down to expand the rice paddies. Large, unprocessed natural stone was used to make this pole, which is almost as tall as an average grown-up man; only one front side of the stone was carved. It has rather chubby body and long slit eyes, narrow, partly missing nose, and small mouth with the tongue stuck out playfully. 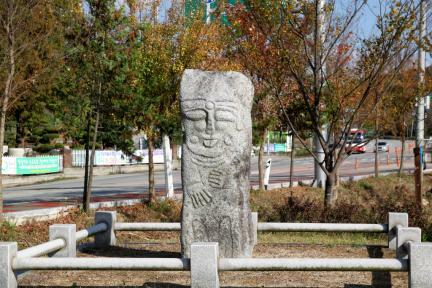 Villagers claim that it is a male pole, but the little round lumps on its forehead and both cheeks remind people of yeonji (round red spots painted on a bride's cheeks as part of the traditional wedding costume); thus, it seems to be a female pole. Like the dolharubang (old man stone) in Jejudo Island, it has both hands delicately depicted, down to each finger, which is very unusual in guardian posts. It is assumed to date back to the Joseon Dynasty, but its exact date is unknown. A fine example of folk art, it has high research value. ※ In December 2004, the stone guardian post, together with the one (Important Folklore Material No. 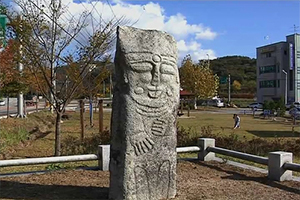 101) in Chungsan-ri, was moved to the backyard of the Sunchang Cultural Center located on the roadside between Sunchang and Namwon.